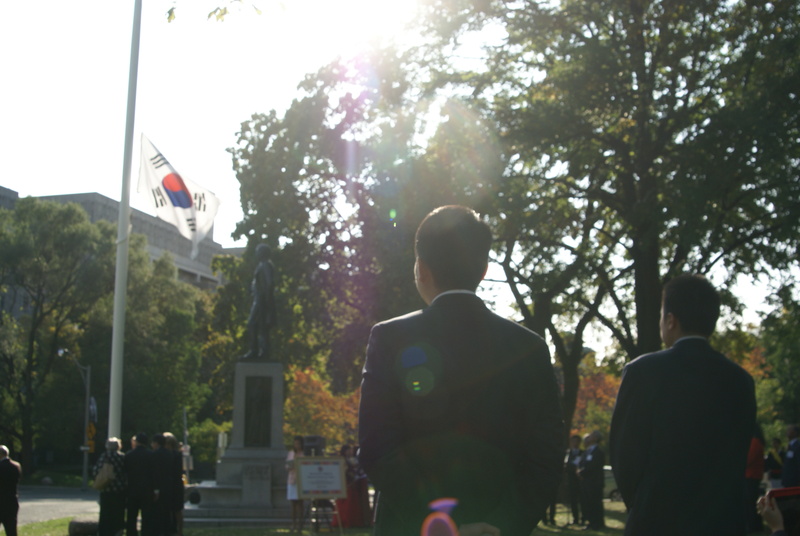 October 3rd 2013 was a Day for Korean Canadians in Canada. A flag raising ceremony and a reception was held in the Ontario Provincial Parliament building in Queen’s Park, Toronto in commemoration of the day. The decision to make October 3rd was a very sensible decision as it is also celebrated in Korea as Gaechunjeol, or literally put, “the day the sky opened.” Since the early days of the Republic of Korea, going as far as to its Provisional Government days in Shanghai, it was celebrated as the national foundation day of Korea. Exactly how did the sky open? Samguk Yusa paints a very detailed story of the beginning of Korea as we know it. According to Samguk Yusa, there lied Hwan-ung, son of Hwan-in, who resided in the heavens. Hwan-ung, envious and curious of the human world insisted that he would part with the heavenly kingdom up in the skies and try to assert his will in the world of men. So the sky opened. We don’t know how he did it, but Hwan-ung came down from the sky, bringing his three thousand followers to establish the city of Sinsi (literally put, the City of God). Hwan-ung enlightened his human subjects over three hundred and sixty matters: farming, fate, disease, the law, and the nature of good and evil are some of the matters governed by Hwan-ung. And then the story gets very interesting. While all this was happening, a tiger and a bear lived in a same cave. Being roommates, they both wished to change from their furry selves into humans. So they took the hike to Sinsi (certainly to the city dwellers’ horror) in order to plead to Hwan-ung so that they too could walk on two feet as humans. Hearing their plead, Hwan-ung gave the furry roommates a handful of garlic and wormwood, and told them that if they endure one hundred days without seeing the sun by only eating garlic and wormwood, they too will become humans. So off they went hesitantly chewing on wormwood and garlic. The problem however, was that tiger was, and still is, a proud carnivore; garlic and wormwood wasn’t necessarily its essential diet. So the bear, enduring its omnivore self for 21 days, was granted a woman’s body, while the tiger sat inside his cave feeling devastated. This bear, now turned a woman, married Hwan-ung and begat a baby boy named Dan-Gun, who in turn founded the Old Chosun — the origin of Korea as we understand it. By all means that is an intense origin myth involving many creatures in all walks of life. Of course, Dan-Gun isn’t just a myth. Today, the myth is understood to be an origin myth for the ancient state of Chosun (to distinguish from the later Chosun which lasted from 1392 to 1910, we now call them Old Chosun, and so will this article). Old Chosun is thought to have occupied Southwestern Manchuria and Northern Korea for several hundreds of years, if not thousands. The oldest record of Old Chosun dates back to 7th century BCE. Dan-Gun of course, is understood to be the title of the ruler of Old Chosun. There is not much we know about Old Chosun. We know that it actively traded with its neighbours, often using currencies used by states in China. It also fiercely competed with the State of Yan during the Warring States Period in China for the control of Liaotung Peninsula. We also know that in became a centralized state with the introduction of Chinese refugees from the State of Yan, and that Old Chosun had very simple but very strict laws in order to assert social control and protect private property of its subjects. A person who killed another person would be put to death. If a person harmed another, the person would compensate the victim with grain. Thieves would be made slaves, unless they could pay the bombastic fine to set them free. All evidence leads to the conclusion that Old Chosun was a sophisticated political entity, capable of trading, waging large wars, and asserting its own laws over its subjects. Old Chosun came to an end in 108 BCE. From Chinese records we can gather that Old Chosun expanded greatly during the political turmoil in China during the first century BCE, and soon took control of communication routes between Han Dynasty and Southern Korean states, dictating authority over the Korean Peninsula. In the meantime, Han Dynasty also had its interests laid on asserting its hegemony over its peripheral area as well, defeating peripheral tribes and states not allied to Han Dynasty China. Without doubt, this led to significant tension between Han Dynasty and Old Chosun, ultimately leading to war. The war was not short; Han Dynasty launched several campaigns that lasted many years and endured many more defeats before it could kneel the old state of Old Chosun. Han Dynasty established four military commanderies inside key domains of Old Chosun, although only a few survived to assert influence within the region for a long time. While the Old Chosun perished in 108 BCE, it still had a lasting legacy in the Korean Peninsula and its peripheral regions. For one, Samguk Sagi tells us that many Korean Kingdoms established immediately after the fall of Old Chosun derived its legitimacy through proving its relations with Old Chosun, or at the very least grew into significance through resisting the Chinese commanderies within the domains of Old Chosun. Moreover, the name Chosun was revived in 1392 by the (new) Chosun Dynasty founded by Lee Syung Gye. Since then, in some parts it served as a name to describe the greater Korean community, and in some parts of the world, it still does. For example, Korean Diasporas inside China still take on the nationality of “Chosun,” calling themselves “Chosunjok.” Korean Diasporas inside Japan also take on the nationality of “Chosun” if they have not decided to naturalize to either Japan or Korea. What meaning does the term “Chosun” carry for Koreans? At any rate, it is safe to conclude that Old Chosun, while we do not know too much about it, plays a significant role in creating the identity of Korea and Koreans today.